Duke Energy is continuing to support two Clemson summer programs — one for middle school girls and one for incoming University freshmen — with an $85,000 grant from the Duke Energy Foundation. Both programs are aimed at increasing diversity in the pipeline that carries talent from the classroom to the workplace. Project WISE is designed to educate middle school girls about opportunities in science, technology, engineering and math, or STEM, at a time of life when peer pressure tends to drive them away. The PEER and WISE Experience offers 50 incoming freshmen a head start on academics and campus life. Both programs, which are based in the College of Engineering, Computing and Applied Sciences, are designed for students from groups who are underrepresented in STEM fields, including women and minorities. About 60 middle school girls attended Project WISE this past summer. This year’s program targeted Title I schools in the Pee Dee, a region where Duke Energy is working to have great impact. 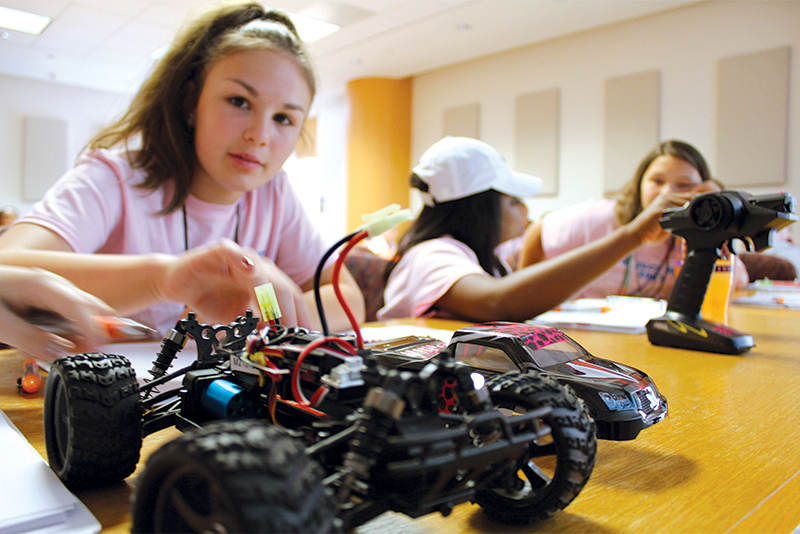 Girls attended mini-courses in a range of topics from electrical engineering to computer science, taught by Clemson faculty and staff. Ten undergraduate Clemson students lived in residence halls with the Project WISE girls. The PEER and WISE Experience, based on two previous summer programs aimed at helping ease students’ transition to college, had its inaugural three-week session in July. While living on campus, students studied college calculus, physics and chemistry and learned about research, graduate school and success strategies, such as time management. They also met alumni, providing them role models to emulate. Four programs at Clemson will be enhanced this year by a $115,000 grant from the Duke Energy Foundation. PEER (Programs for Educational Enrichment and Retention), which helps freshman minority students adjust to college life; WISE, which supports females in engineering and science majors; EMAGINE!, which encourages middle and high school students to consider engineering as a career; and a teacher education course that introduces S.C. teachers to the educational resources at the Duke Energy Bad Creek Hydroelectric Station will share in the grant. Clemson is now home to one of the world’s largest and most capable electrical grid simulators. Thanks to the work of Clemson graduate and eGRID creator Curtiss Fox, one day, renewable energy sources like wind, solar and more will do even more to make things go. When the lights flicker, we barely notice. Our homes stay warm. Our laptops switch to battery backup. Maybe an old clock radio needs a reset, but otherwise life goes on uninterrupted. In the world of distributed-energy production, however, even a momentary disruption in power can be a big deal. Whether it’s something as small as a voltage fluctuation (think: a squirrel in a transformer or a tree falling on a power line) or something as significant as a cyber attack on the power grid, knowing how the next generation of energy will respond to these disruptions matters — a lot. That’s where Curtiss Fox of the Clemson University Restoration Institute (CURI) comes in. The work he and his team are doing today at the University’s Energy Innovation Center on its grid simulator will forever change the way we power our nation, and even our world. The Duke Energy eGRID has been under construction at Clemson’s Charleston-based testing facility since the first of this year, shortly after Fox was named director of operations. Assembly wrapped up on the eGRID this spring, and the summer months will be spent essentially turning the equipment on in preparation for the center’s first customer: a private company affiliated with the energy industry. Although the proverbial switch has yet to be flipped, the eGRID project has been four years in the making, with Fox at the helm since the very beginning — first as a Ph.D. student and now as director of operations. It’s no wonder the prospect of making the simulator come to life, likely sometime this fall, is so thrilling for Fox. J. Curtiss Fox receiving his doctoral (2013) degree in electrical engineering from Clemson. FOX RECEIVED HIS PH.D. IN ELECTRICAL ENGINEERING in December 2013, but his work on the eGRID project dates back to May 2010. At that time, the Department of Energy had just awarded a grant to the drivetrain facility so that it could conduct mechanical testing of wind turbines by constructing two wind turbine dynamometers: one 7.5 megawatts, one 15 megawatts. The Department of Energy grant had a specific purpose: to allow Clemson to perform Highly Accelerated Life Tests on wind turbines — in layman’s terms, the tests are designed to simulate extreme events, those outside the turbine’s normal operating range, to see how they respond. These tests are important before the turbines are deployed to the field for obvious reasons, namely to prevent equipment failures and avoid expensive replacements on the highly technical equipment. About the time the grant was awarded, Fox’s longtime Clemson adviser, Randy Collins, associate dean of the College of Engineering and Science and professor of electrical and computer engineering, attended a presentation about the then-proposed wind turbine drivetrain testing facility. Collins spoke with Energy Innovation Center facility director and senior scientist, Nick Rigas, and learned about an electrical diagram of the proposed facility. On that diagram, there was a box. But no one quite knew what type of equipment was going to go into the box. Collins mentioned to Rigas that he had a grad student who could look into that for him. A few weeks later, Fox drove to Charleston. He met Rigas. He landed the job: grad assistant at CURI. Fox’s main objective was to figure out what kind of electrical equipment went into the box. He also was charged with designing power-flow studies and studying the transient response of the electrical equipment within the facility. The rest is history, or the future — as the case may be. THE BOX HAD A NAME, if not a specific function: LVRT equipment. It turns out it was actually an addition to the wind turbine facility’s electrical system. It wasn’t until after the grant was awarded that the Department of Energy came back to Clemson and asked if the University could also look at working an electrical test into what was otherwise mechanical testing of the wind turbine drivetrains. The answer, thanks to Fox, was “yes.” That box was right in his wheelhouse. Low Voltage Ride-Through, or LVRT, is the ability of electrical equipment to keep working even when there are brief disturbances in the power system — something like lightning strikes, fallen trees or even animals on the power lines. When the lights flicker or short out, it’s because the flow of electricity has been disrupted. Fox had been pursuing a thesis on the subject, and now he had an opportunity to give it real-world application. So, Fox developed a grid simulator to troubleshoot these kinds of power interruptions and reduce the risks that those in the energy industry worry about as they try to integrate new technologies into the electrical grid. Since then, Fox’s work to bring this capability to the Energy Innovation Center has introduced a world-class, advanced testing platform capable of modeling grid conditions anywhere in the world. The grid simulator is a center for innovation, where energy efficiency, energy storage and smart-grid technologies can be developed, tested and certified before they are rolled out for the mass marketplace. All the while, the project has been an opportunity to educate industry about power systems engineering and to show them how it could impact their future workforces. “THE QUESTION THAT ARISES IS, ‘How do we go about integrating the renewable, distributed, new-generation storage energy equipment into the existing infrastructure, such that you can offset costs associated with upgrading the infrastructure?’” Fox explains of his work at CURI. Think of it like this: Say you have a power line feeding a neighborhood, and then a developer decides to build again, and the neighborhood doubles in size. “They would either need to install another power line or rebuild it with bigger equipment,” Fox explains. That’s exactly the kind of technology Fox’s grid simulator works to troubleshoot, something that is of great interest to utility companies, energy equipment manufacturers and national energy officials, among others. Specifically, the eGRID houses equipment that facilitates testing of the three key renewable energy technologies: energy storage, wind turbine energy and large, utility-scale solar energy. It is this third and final component of the testing facility, a Photovoltaic (PV) Array Simulator, that is the most recent innovation moving Clemson to the forefront of the alternative energy field. Clemson’s PV Array Simulator — which essentially combines several acres of solar panels designed to capture energy from the sun into a small box — is scheduled to come online this fall, and when it does, it will be the largest such simulator in the world. It will also make Clemson’s grid simulator the only one in the world capable of testing all three of the key renewable-energy technologies. The $98 million testing facility has been funded by a $45 million Department of Energy grant, and matched with $53 million of public and private funds. The eGRID represents another $12 million on top of that. It’s truly pioneering technology, something officials at the highest levels of government have taken notice of, including U.S. Deputy Secretary of Energy Daniel Poneman. J. Curtiss Fox (right) chats with U.S. Secretary of Energy Daniel Poneman at the dedication of the SCE&G Energy Innovation Center. LAST YEAR FOX AND HIS COLLEAGUES FILED A U.S. PATENT on the grid simulator while he also successfully defended his dissertation on Low Voltage Ride-Through technology. The grid simulator project is now a separate, Department of Energy-sponsored project supported in large measure by corporate partners including Duke Energy and SCANA. It’s Fox’s past collaboration that bodes so well for the future of the electrical grid.